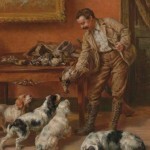 He was a painter and avid sportsman who owned champion, prizewinning field dogs. Is it any wonder that he would become remembered for his sporting scenes and landscapes which usually featured pedigreed dogs? Edmund Henry Osthaus was born in Hildesheim, Germany in 1858. He attended the local Gymnasium and went on to study at the Royal Academy of Arts in Düsseldorf. He was a student of or influenced by a number of artists including Andreas Müller (1831-1901), Eduard von Gebhardt (1838-1925), Ernst Deger (1809-1885) and Christian Kröner/Kroener (1838-1911). These four artists provided young Osthaus with a well-rounded background in a variety of styles and subject matter. Deger, Gebhardt and Muller painted primarily religious subjects, both architectural works and on canvas. Kröner was a wildlife and landscape painter and would appear to have had the greatest influence on Osthaus. He traveled with his father Henry to Mexico with the Archduke Ferdinand Maximillian who was invited to become the Emperor of Mexico in 1864 during a period of great strife within that country. They fled to the United States when Maximillian was executed before making their way home to Germany. His parents immigrated to the United States first and Osthaus followed them in 1883 with his sister. He was invited to become principal at new the Toledo Academy of Fine Arts. In 1892, he married Charlotte Becker with whom he had several children. 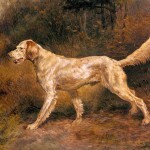 Osthaus left the Academy in 1893 to spend more time working with his field dogs (primarily setters and pointers), shooting and to pursue his painting. That year he opened a studio in Toledo. 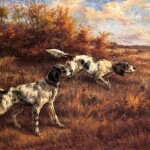 Osthaus was both a sportsman and an artist. He was proficient with a rod and wheel, able to shoot a bird on the wing as well as capture nature to canvas. He helped found the National Field Trial Association and for its first 30 years immortalized each year's field trial winning dogs. He painted a series of “champion portraits” that the Du Pont gunpowder company used as advertising pieces like calendars, postcards and lithographs. By 1911, Osthaus opened a second studio in the Walker Theater Building in Los Angeles and exhibited at the San Diego Fine Arts Gallery up to 1927. He also had a home in Summit, New Jersey. While Osthaus is most well-known for his sporting dog pieces, he also completed many fine landscapes of cowboys on horseback, horses, cows and traditional portraits. Many the portraits included the subject's favorite dogs. He worked in oils, water color, pen and ink and pencil. His last work, a dog's head sketched days before he died, was drawn on a friend's table cloth in pencil. Jokingly the host asked the artist to sign the work and upon the artist's death said that the scrap of fabric had become one of his most cherished possessions. Osterhaus died at his quail-hunting lodge in Marianna, Florida in 1928. His works appeared in The American Legion, Colliers, Cosmopolitan, Field and Stream, McCall's, Redbook, and The Saturday Evening Post. His original paintings are highly sought after and some have fetched auction prices into the six figures. Ames Plantation in Grand Junction, Tennessee, where the National Field Trial Championships are held annually, is home to a large collection of Osthaus paintings and is open to the public by appointment.